Once that sacred space is claimed, it must be nurtured. Parker imparts the wisdom of the elders–lessons she learned growing up in a multi-generational family–to instruct readers on cultivating their Promised Land. Her narrative weaves in the practical advice of her maternal grandparents, Joseph Everett and Pearl Cargill Parker, and illustrates the usefulness of words and actions. Parker cherishes the memories of her grandparents and the lessons to be learned from both family and collective history. This book should cause readers to think about applying the lessons they’ve learned from their grandparents as well. 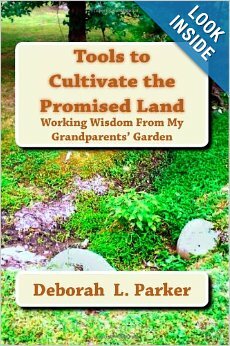 This entry was posted in Book Reviews, Books, Family and tagged Deborah L. Parker, Garden, Grandparents, The Promised Land, Wisdom by Da Realist 1. Bookmark the permalink.